There are great sites like espnW and Women Talk Sports that have begun to pave the way to a positive social media presence of female athletes, but there is still a long way to go. Majority of the time when a female athlete is mentioned in the news she is mentioned like the headline below. People would not only find that ridiculous but absolutely absurd, so absurd that it would never even cross a writer’s mind to write anything like that. Yet it seems second nature today in media to have a female athlete’s relationships, personal life, or body image mentioned along with her athletic talent. 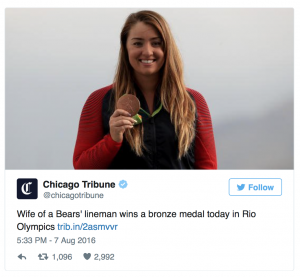 Not only are female athletes underserved and misrepresented when it comes to social media, but the average women writing about athletics are not helping either. When I researched blogs about female athletes, I came across an article listing the top blogs for female athletes. My search made me very disappointed. None of the blogs were about female athletes, the only one remotely close was A Female Athlete Appreciation Blog, which is just a tumblr account but does at least support female athletes in the world. The other blogs I read and looked at were women writing about sports in a way a woman “would like” to read it. For example, Cosmos and Cleats: helping girls learn about sports without having to ask the boys. The blog is highlighted mostly by recipes of appetizers to serve while watching games or the highlights of the NFL season so a girl can stay in the conversation. Most of the blogs in this article were like this one, a blog written so that a woman could participate in the world of sports and communicate better with men. The goal of my blog is to write about the accomplishments of female athletes the way they should be talked about from Serena Williams to Catherine Perlmutter of Dickinson College. If social media was the coach, female athletes would be on the JV team.